No, not the powdery stuff many of us remember mixing with milk from boxes of Kraft Macaroni and Cheese in our dorm rooms. Dutton's fromage, like her molecular biology laboratory in the Applied Physics and Mathematics Building, is a lot more complex and cutting edge. 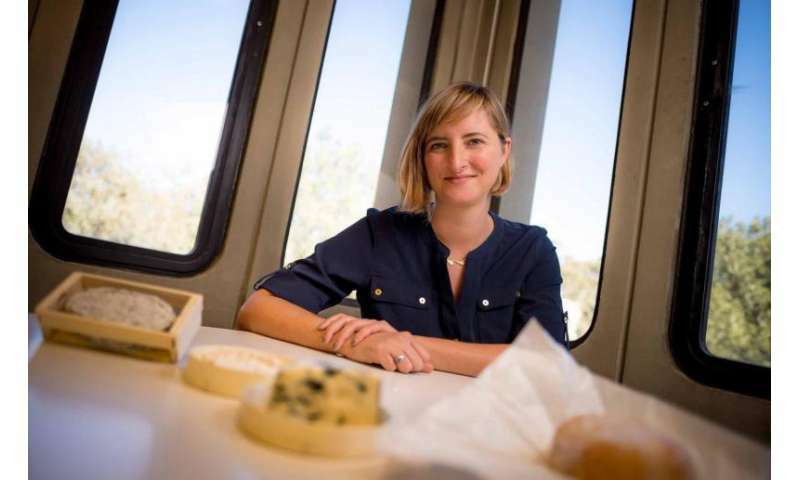 An assistant professor in UC San Diego's Division of Biological Sciences, Dutton examines the communities of bacteria and fungi that produce different kinds of hand-crafted "artisanal" cheese in order to better understand how microbial communities form and work together. "Cheese is the lab rat in my research," she tells visitors to her lab, which is filled with petri dishes of bacteria growing on agar and milk curd—what she calls "in vitro cheese"—that emit the distinctive odors of blue, Swiss, goat cheese and Camembert. Dutton arrived on campus last fall after a five-year independent fellowship at Harvard University during which she applied new genetic sequencing techniques to reveal the bacteria and fungi responsible for more than 130 varieties of artisanal cheeses from 10 countries around the world. Her knowledge of microbial fermentation—as well as her own passion for good food—even led to an appearance on a recent episode of the Netflix documentary Cooked, based on the book by Michael Pollan. And it's convinced many of her scientific colleagues that her unusual approach to studying microbial communities by using artisanal cheese as a lab rat may not be such a cheesy idea after all. "Whenever I tell other scientists I work on cheese they're intrigued at first," she says with a smile. "Then, when I explain why I'm working on cheese, they say, 'Oh, I wish I had thought of that.' It's a different way of approaching a problem that needed solutions." So why cheese? What makes the fermented milk product that's been hand crafted by artisans around the world for nearly 10,000 years of human history such a great ecosystem to understand how microbial communities form and develop over time? "Cheese, I thought, was the most promising biological system because it has an intermediate level of diversity," explains Dutton, unlike yogurt, for example, which is produced by just two kinds of bacteria. "It's not super complex, but it's not super simple, which means we have interactions, properties and dynamics that we wouldn't see in a simpler system. 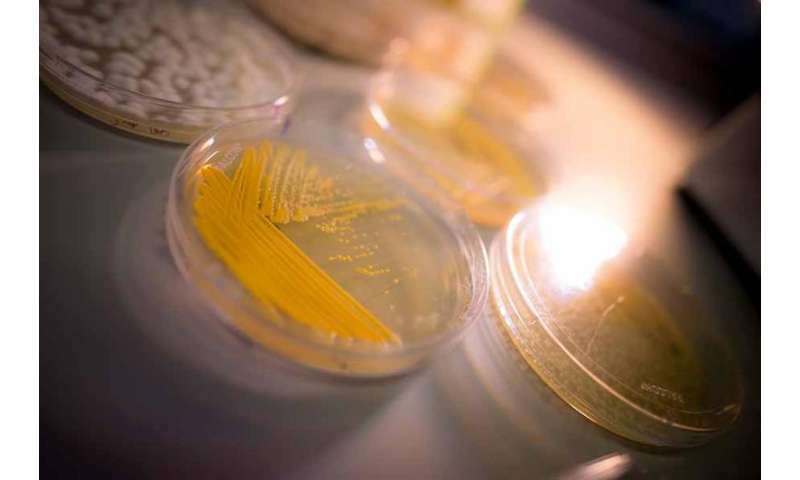 And we also have both bacteria and fungi, so this is a way to study a fairly diverse set of organisms in an ecosystem that's a microbiologist's dream." Dutton is part of a new campus-wide Microbiome and Microbial Sciences Initiative designed to bring together researchers whose collaboration should lead to a more detailed understanding of microbiomes—the distinct communities of bacteria, viruses and other microorganisms that live within and around us—to benefit human health and the environment. With cheese, she says, "we have the potential to discover a lot of new biology because we're looking at communities in a way that's difficult to do in other systems and we can actually work with them in the lab. "Cheese has been made for close to 10,000 years, and it's an example of how humans have very precisely manipulated microbial communities without even knowing the details. People figured out that if they changed the moisture this much or added this ingredient or that, it's going to create this type of community instead of this other type of community. So I think it's interesting that we can learn from this history of cheese making how we could actually manipulate microbial communities." The hundreds of varieties of cheeses can be divided into two basic categories: fresh cheeses and aged. Making fresh cheese is relatively simple: Add lactic acid bacteria to cow, sheep or goat's milk, then allow the bacteria to multiply and ferment the mixture. Fermentation and the coagulation of the milk protein casein turn the milk into a sour and acidic semi-solid, which can range from the French chèvre, or goat cheese, to an Italian mozzarella, made with buffalo milk. "There's lots of interesting microbiology there," says Dutton. "But the part of the process that gets me really excited is when you take that fresh cheese and put it in a cave and let microbes from the environment come and colonize that cheese. With a cheese like Camembert, you actually get colonization of the surface of the cheese with a collection of bacteria and fungi, which are all living together and interact with each other on the wheel of cheese." The next time you're in a supermarket, take a close look at the blue veins of a Roquefort, the bubbles within a wheel of aged Swiss and the white, powdery rind surrounding a gooey Brie. Those aged cheeses are the result of fungi and bacteria working together on the fresh cheese curd to transform it into different and distinctive products using the techniques that have been passed on through generations of cheesemakers. Cheesemakers long believed that the distinctive flavors of artisanal cheeses were the result of their place of origin, due in large part to the unique microbial makeup of the caves in which they were aged. But Dutton and her Harvard colleagues found, to everyone's surprise, that no matter where in the world they are made, each style of cheese is remarkably similar in its microbial makeup. In other words, the environment a cheesemaker creates when aging cheese attracts pretty much the same complement of microbes, whether the cheese is made in France or Wisconsin. However, Dutton is now examining these species more closely to see whether changes in their genomes could lead to differences in flavor production. One of the things most people don't realize when they cut into the outer shell of a Brie or Camembert or any other type of aged cheese is that the rind, or outer membrane, is a "biofilm"—a living matrix containing many different species of bacteria and fungi, much like the dental plaque that adheres to your teeth. How that community of bacteria and fungi come together in the first place, interact and evolve over time are some of the questions Dutton is seeking to answer. In a sense, the biological interactions that occur during the production of artisanal cheese serve as a window by which Dutton can view the interactions of microbial communities in greater detail. In her laboratory, Dutton and her students grow communities of microbes in their "in vitro cheese" system from bacteria and fungi isolated from certain kinds of artisanal cheeses. "With the in-vitro cheese system, we're actually rebuilding complete communities in our lab," she says. "The goal is to dissect the interactions that are happening within a community and, because we have the ability now to build a community in the lab, that means we can also pull it apart. We can observe the community as it forms and look for interactions as they are occurring. We can also remove species and see what impact that has. It really allows us to control the variables, which is what you want to do as an experimental biologist." To find out what sorts of microbes are in her cheese samples in the first place, she and her students use DNA sequencing techniques developed by Rob Knight, a professor of pediatrics and computer science and engineering who heads the campus microbiome initiative, to identify the bacteria living in the human gut. Once isolated, the biologists keep them in a lab freezer for later use, in various combinations, to try to understand how they interact in forming a cheese community. "We can look at questions like how do these five species grow together, so we pull them from the freezer, put them together in our in vitro cheese and watch what happens," Dutton says. "It really expands the types of questions we can ask." "This is a very basic model for how to build communities and how to manipulate them, and we're hoping that the principles we discover from this model system can be applied to any environment, whether you're thinking about how to manipulate the gut microbiome or the skin microbiome," she adds. "The other thing in terms of human health is that this is an ecosystem that we're eating. We've started studies to look at what happens to these microbes when you eat them and whether they actually have any impact on the gut microbiome." In addition to Knight, Dutton has been collaborating with two other faculty leaders involved the campus Microbiome Initiative—Pieter Dorrestein, an associate professor of chemistry and biochemistry and pharmacology, and Kit Pogliano, a professor of biology and longtime mentor who gave Dutton the opportunity to work in her research lab 16 years ago when she was a junior at UC San Diego. "I was really intimidated by science at the time," remembers Dutton. "And I thought everyone who studied biology was going to be a medical doctor, which I had no interest or inclination in doing. The only biology class I had taken was Kit's class, a non-majors class called Microbes and Medicine, so I contacted Kit and asked her at the beginning of my junior year if I could volunteer in her lab to see if I liked doing science. And I just absolutely loved being in the lab. I felt completely in my element in a way that I hadn't with the other areas I was exploring as an undergrad. I started taking molecular biology and other biology courses, and it was very clear to me that this is what I should be doing. So I switched my major from communications to molecular biology." After graduating from UC San Diego in 2002 with a bachelor's degree in molecular biology, Dutton worked in a microbiology laboratory at UCLA for a few years then applied to graduate school at Harvard Medical School. "I had always heard great things about the microbiology department at Harvard, because Kit was a grad student there, so that was my dream place to go, to follow in her footsteps," she says. 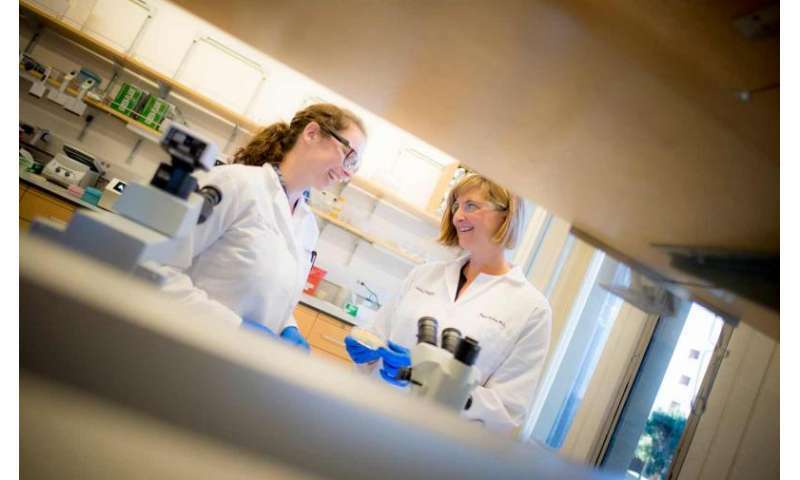 "And it turned out that I followed in her footsteps more than I thought because I ended up working in the same lab that she had done her Ph.D. work in. We both did our Ph.D.s with Jon Beckwith, a phenomenal scientist and mentor." So how does Dutton feel about coming back to the campus where she fell in love with biology and working again with the mentor who gave Dutton her first research experience? "It's a dream," says Dutton. "It feels a little surreal. Coming back to campus, I was remembering my first day here as an undergrad. It's an amazing experience to be able to come back here as a professor. I never really imagined that I would someday have the opportunity to come back and help train the next generation of biologists at UC San Diego."